The Third Global Governance for Health Roundtable will take place September 29-30 in Cape Town, South Africa, just before the Third Global Symposium on Health Systems Research. The HFG Project is collaborating with the Leadership, Management & Governance Project and the Health Policy Project on the event. The following blog post describes the state of the health governance evidence alongside findings from a recent USAID/HFG workshop designed to develop an action plan to address key gaps. 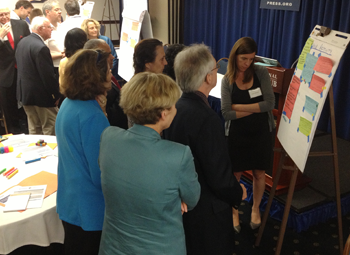 Experts from USAID, WHO, the World Bank, and implementing partners gathered on July 23 at the HFG Governance Workshop. As donors and governments increase their emphasis on improved accountability and transparency in the health system, there is an amplified need for increased evaluation and sustained learning of how governance activities can have the strongest impact on these intermediate outcomes. But the overall lack of evidence and understanding of the dynamics of how, and contexts in which, improved governance can influence health is striking. The lack of consolidated research agendas. There is still a need for comprehensive understanding of what evidence exists and where the gaps still lie. The complexity of governance interventions. Activities or interventions to improve governance take place in dynamic political environments that makes measurement and attribution difficult to assess. Definitively linking governance interventions to specific improvements in health outcomes can be challenging. Governance and health issues can vary region to region, making cross country studies difficult. Governance interventions can be a hard sell and the lack of evidence may offer further justification for avoiding efforts to improve health governance. A recent USAID Health Finance and Governance Project (HFG) workshop brought together more than 50 health and governance professionals from USAID, prominent external organizations including the World Health Organization, and implementing partners to discuss important evidence gaps and develop an action plan to address them. An overview of the existing state of evidence indicates that this is a neglected area of research. Within USAID, both the Office of Health Systems Strengthening (OHS) and the Center of Excellence on Democracy, Rights and Governance (DRG) are pursuing ambitious agendas to deepen evidence. For DRG, this includes a series of randomized control trials testing the impact of specific governance interventions on health outcomes. The lack of sufficient understanding of the factors that motivate leaders for or against health reform. How to promote the sustainability of governance reforms. Proof that governance leads to sustained improvements in health outcomes. How political factors serve as barriers to achieving health outcomes. The impact of corruption in the public vs. private sector services. Evidence for whom? The emphasis of much of the discussion has focused on generating evidence to influence donor decision making. Evidence is also needed for country level policy makers and health leaders. With domestic resource mobilization becoming an increasing priority, an understanding of the systems and accountability structures necessary to increase the resource base, as well as enable efficient, effective allocation and utilization of funds. What type of evidence is needed? Recognizing that there are different audiences for evidence of how governance can contribute to improved health outcomes, the type of evidence also must vary. Donors and country level policymakers have very different metrics that define their evidence needs. The evidence generation approach we take needs to depend on the audience. Where to focus? In the face of limited resources for evidence generation, we need to focus research efforts not only on how governance interventions contribute to health outcomes but on identifying those interventions, methods, and approaches that prove to be most effective.